Whether you are towing your kids, your dog, or a cooler full of refreshments, the Robert Axle Project has the thru axle solution. The Kid Trailer Thru Axles allow you to attach a “hitch mount” style trailer, to any thru-axle equipped bike. Machined & tested in the USA, the Kid Trailer axles are designed for maximum strength & ease of use. - For use with hitch mount style trailers common with child carriers such as Thule/Chariot, Burley, InStep, Croozer & more. - Stainless steel axle end provides an M10x1 threaded stud that accepts any hitch from popular trailers. - Trailer hitch is NOT included. Customers will use hitch provided by trailer manufacturer. - Installed or removed using a 5mm Allen wrench. - Designed, built & quality tested in the USA. Proven around the world. - The true length of this axle shaft is 181mm long. 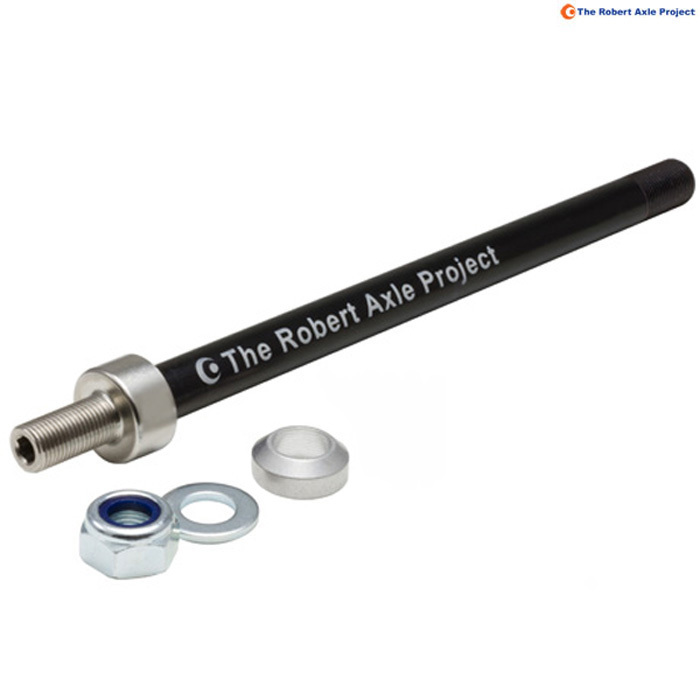 This axle comes with a 6mm tapered (X-12) spacer. So this axle can be 175mm with spacer.